No fewer than 821 candidates will vie for governorship seats in 29 states of the federation during the 2019 general elections, according to a tally using the data published recently by the electoral commission. Governorship elections will hold on March 2, 2019 in all but seven states across the country. The seven states are Anambra, Bayelsa, Edo, Ekiti, Kogi, Ondo, and Osun. Though the two leading parties – the governing All Progressives Congress (APC) and the opposition Peoples Democratic Party (PDP) – are expected to dominate the polls because of their spread and resources, other parties will likely spring surprises. The Independent National Electoral Commission (INEC) had earlier said 91 registered political parties would be sponsoring candidates for various positions across the states. Imo State is top on the list with 68 governorship candidates, while Delta and Yobe states share a space at the bottom with two candidates each. Sokoto, Akwa Ibom and Borno states have 41 candidates each, while Zamfara, Ogun and Enugu states have 39 candidates each. There are 38 candidates in Kaduna, 37 in Oyo, 36 in Niger, 34 in Ebonyi, 33 in Gombe, 32 in Kwara and 29 in Abia. These were followed by 28 in Kebbi, Taraba and Bauchi; 23 in Kano, 21 in Plateau, 18 in Jigawa. Katsina has 17, Nasarawa 11, Benue 9, Rivers 7 and Cross River 3. INEC had on November 9 published Form CF001 (Personal Particulars) of governorship candidates sponsored by various political parties. Our correspondents, who reviewed the particulars of governorship hopefuls pasted by INEC in state offices, report that the total number of candidates for 2019 dwarfed that of 2015 elections. While the PDP is contesting the governorship seats in all the 29 states in the general elections, the APC is yet to have a candidate for Zamfara, where INEC disqualified the party for allegedly not holding any primaries. The party is however challenging the decision of the electoral body in court, which means Zamfara may have an addition candidate if APC wins in court. Some famous but aggrieved aspirants who could not secure tickets in either PDP or APC have joined other less known political parties and got automatic ticket. In Taraba State, Senator Jummai Alhassan, who resigned from the APC following her disqualification by the party, is the now the governorship candidate of the United Democratic Party (UDP). In Kano, Malam Sagir Takai, who could not get the PDP ticket, moved to the Peoples Redemption Party (PDP) and is now its flagbearer. In Bauchi, former health minister Prof. Mohammed Ali Pate, left the APC, and got the ticket of the PRP. In Ogun, the home state of former President Olusegun Obasanjo, the African Democratic Congress (ADC) had given its ticket to Prince Gboyega Isiaka. The ADC became popular soon after it fused into Obasanjo’s Coalition for New Nigeria (CNN). Senator Abdulaziz Nyako and Emmanuel Bello have also secured the tickets of ADC and Social Democratic Party (SDP), respectively in Adamawa State. Sources said many smaller political parties would use between now and the December 1 window given by INEC to substitute their candidates currently on INEC list with prominent politicians that are still weighing options in big parties. Governor Ibikunle Amosun (Ogun), Rochas Okorocha (Imo) and Abdulaziz Yari (Zamfara), whose preferred candidates could not secure APC ticket, are still battling with the National Chairman of the party, Comrade Adams Oshiomhole. 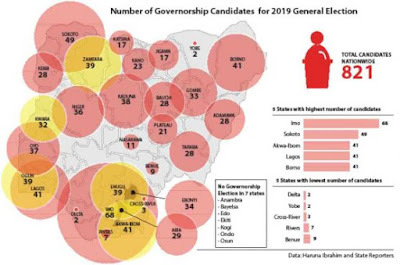 Analysts say the large number of gubernatorial candidates ahead of 2019 general elections might be connected to the number of political parties that were registered by INEC soon after the 2015 general elections. INEC Chairman Professor Mahmood Yakubu had in July this year ahead of registration of additional 23 political parties said the law stipulated that any association that qualified to be a political party must be given the opportunity to expand the political space. On the way forward, he said, “Nigerians should ask all those seeking for their votes about their contributions in their various disciplines.